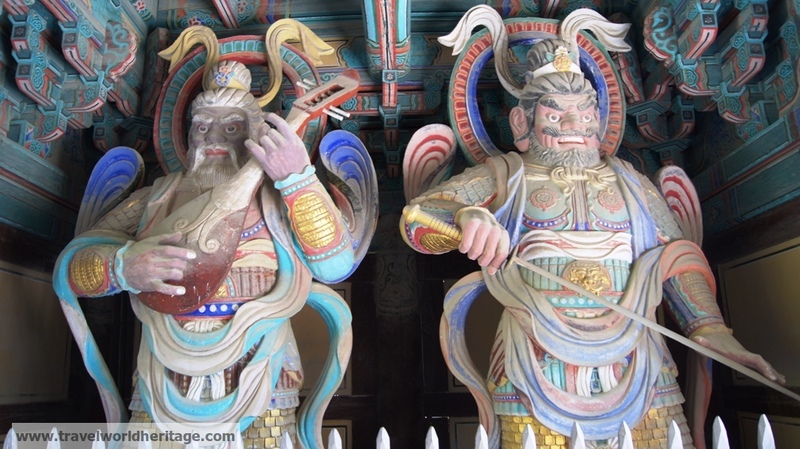 The Four Heavenly Kings are these depictions of gods that often stand at the entrances of Buddhist temples. While I didn’t notice them at first, now that I know what I am looking for, I often find them while exploring these temples. They are human like statues made of wood, with faces that look like beasts, and often towering 3-4 meters tall. To an outsider like me, it feels like it doesn’t fit, but I suppose it makes sense to a devout Buddhist. These two, and the two directly behind me, are found in Bulguksa Temple in Gyeongju, South Korea. They are some of the most elaborate ones I’ve seen as most have had their color fade away over the years. The fence at the bottom is about 5 feet tall, so the statues are about 12 feet tall (but be warned, I am terrible at estimating heights).